Book Blurb – Canada – the land of beautiful lakes, opportunities and umm… scores of desis (aren’t we just everywhere?). What happens when a young man gets a one-way ticket to the hallowed country? When you’re saat samundar paar, even a modest course at a community college becomes a gateway for merriment and learning… of a totally different kind. And so it did, with Gaurav. An Australian flatmate, fellow students from Nigeria and Bangladesh and an employer from Kazakhstan lead him on a journey of epic escapades and much self-discovery. And when you’re looking to earn some pocket money, odd jobs just have to do. From a curious DJing gig that turns out slightly different than expected to becoming a walking salesman clad in a sandwich board, there’s no dearth of drama. Jump right in, for Keeping Up With Kaneda is an adventure in itself. 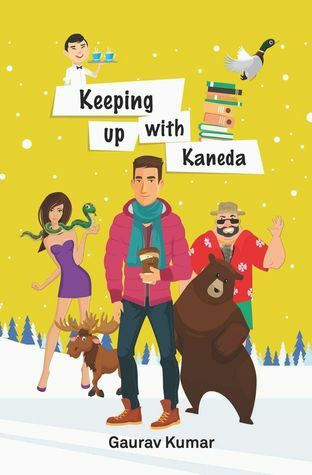 My Critique – To me the title of the book was fascinating ‘Keeping up with Kaneda’ which turned me to read the book. I tried a lot to find the genre of the book but it was a bit difficult for me to find. At times it looks as you are reading the personal journal written in a well scripted way or reminiscence based on Canada visit and personal experiences of the writer. Initially the writer has shown a couple of his failures but those don’t look more than just fun. If the writer was fired from a temporary job which he joined for a couple of days hardly matters to readers or motivates, however it work as a catalyst to develop the interest in the book in order to know what happened next. And then a few more incidents happen and the story off tracked or can say tracked to a new direction. Writer introduces a few more personal life experiences and all of a sudden the story ends. It was the first book by the writer so writer himself seemed confused related to the topic and story that he actually wanted to share. It is a below average book for me and all I liked in the book was the ending quotation, which read as “Because when you do what you love, you will never work a day in your life “. About The Author – Gaurav Kumar is a passionate entrepreneur, an accidental writer, a hobby electronic music producer and a deejay. He did his schooling from Mumbai, studied engineering in Pune and post-grad in Toronto. Quitting his job in Toronto barely six months in, he returned to his homeland to explore himself and start his entrepreneurial journey. An ambivert by nature, his spare time is consumed by watching sci-fi flicks, riding his Triumph motorbike, meeting interesting people, penning down his entrepreneurial ideas, researching the stock market and writing an occasional piece.